The art of focus is the topic we don’t talk much about. Nobody taught us that at school. Sure, we all used to hear the constant “focus on this, focus on that”, but how much do we know about what it really means? How can you master at the art of focus so that it helps you make your life better every day? You will learn that from this article. By definition, in English the words ‘focus’ and ‘concentration’ stand for two different things. Focus refers to a long-term perspective – you can focus on a goal you strive to obtain, while concentration is more short-range – you concentrate on the tasks at hand that bring you closer to achieving the goal. So, what you need is both being aware of the goal and taking the steps on the way leading to it. In Polish, ‘concentration’ and ‘focus’ are basically considered synonyms. And that’s why I will also use these words interchangeably. How can you stay focused when myriad of websites, screens, headlines and ads are contending every day for your attention? Is any concentration even possible when on every corner you’re bombarded with loads of information? Problems with concentration are the reason for getting poor grades at school, making more mistakes, getting tired easier and faster, being stressed out and ineffective. Fortunately, you can train your mind to concentrate. The art of focus is a skill you can master, just like running, swimming, playing music instruments or getting up as soon as your alarm clock goes off. It’s all about the decision you take. And it’s worth it as there are many benefits of mastering the art of focus. We are more effective, we think more clearly and we are able to enter the flow state more often. As you reflect on the fact that human brain is a muscle, you begin to realize that you can train it to work most effectively for you. And when you understand how your brain works, you’ll learn to manage it. When you learn to manage it, you will also master the art of focus. That’s the whole secret. Human brain is an amazing device. Greater than the best computer in the world. When you buy a smartphone, it comes with an instruction manual. Your brain doesn’t. However, if your development is important to you and you want to learn how to use your “computer” more effectively, you explore this subject, come across websites like this one and read articles like the one you are reading now. It is your mind’s natural inclination for growth that has brought you here. The information you are reading is processed by your brain, but you wouldn’t be reading this text if not for the conscious decision you took that you want to read it in the first place. This simple distinction between your mind and consciousness is the key to understanding what focus is all about. To help you understand that better, I will use a metaphor. Imagine that your brain is a huge building, the size of a warehouse, full of nooks and crannies and various objects. Consciousness is your head torch. You turn around and direct the beam of light from the headlamp wherever you choose. As you look around the warehouse, the head torch illuminates the selected part of the room again. Which one? It’s up to you. Now, let’s have a look at how you use your headlamp (consciousness). Think about how many people, stimuli and signals you let yourself be distracted by every day. Think about all the things you have started and did not finish. Can you see how often you let the the light from your headlamp go wherever it wants, for example, instead of reading the whole article, you get sucked by social media. You might have already wondered why you are ineffective but ignored the strategic importance of focus. Now, as you know what mechanisms affect your brain and consciousness, you can make a change. When you get down to a task you need to focus on, the first most important thing you should do is turn off all notifications on your phone or any other distractors. Have you heard about the FoMO syndrome? More and more people suffer from it. FoMO is an abbreviation for ‘fearing of missing out’. People who are constantly logged to social media compulsively check notifications on their mobile devices, because they are anxious that they will miss out on something that is going on in the web. It involves numerous causes and symptoms, which you can read more about here. This issue is quite broad and affects many people, who are often not aware of the fact that they suffer from this condition (chronic anxiety is a disease entity). More and more people have trouble with attention deflection. Technological devices that are useful in certain areas keep us closed in golden cages and cause various problems in other areas. That is why, it is so important to use them consciously. Consciously meaning that you are in charge of the decision making. Simply press the ‘off’ button and turn off the distractors. You might want to turn on some music, if that’s what you like (Stephen King, the master at focusing – just as many other writers – says that listening to music helps him a lot while working; King prefers rock’n’roll, while another horror stories writer Peter Straub – classical music). Listening to music on your headphones (especially with the noise cancelling function on) can help you to shut out the sounds from the outside so that even in less favorable conditions you are able to establish a peaceful oasis of focus around you. Music can turn out to be your ally at focusing – see for yourself if it helps you. To master the art of focus the most important thing is to turn off what disturbs you – and these certainly are: phone, television, notifications, etc. This is the most important, the most universal “tool” that has a beneficial effect on our concentration. I especially recommend the MBSR (mindfulness based stress reduction) technique, also known as mindfulness. It will help you fix many problems and abandon destructive habits that are not good for your health, both mental and physical. You can use the following exercise as an introduction to meditation. Now get ready for a short exercise. Exercise: pick a very simple activity, e.g. looking through the window and breathing, and do it for 15 minutes. You can set the alarm clock, but turn off notifications on your phone. Focus only on this single activity. Don’t judge what you see. Don’t comment on it in your head. During this exercise, don’t think about what you will be having for dinner, don’t make plans or to-do lists. Engage the whole of you in just looking and breathing. Watch the colours of the leaves and the shapes of clouds. After a while, you might also add other senses: smell, hearing, touch. Open the window and breathe in the air. Feel how refreshing it is. Maintain this state as long as you can for a minimum of 15 minutes. How did it go? Ask yourself how you feel. Was it easy for you or not? If not, what do you need to change about it to make it easier for you? Take a moment to reflect on your conclusions. In the daily practice of mindfulness, it is very important that you don’t reprehend yourself for letting your mind wander. Simply observe and note that moment when you let your mind meander again and get distracted. Just like that. Instead of putting pressure on yourself or criticizing yourself, make a conscious decision to take another go and focus your attention. Should you lose focus again, just try again. Relax, don’t rush into it, don’t force anything. As you keep on training your brain in this way, you’ll quickly see that your attention span gets longer and staying focused is not so difficult. Realizing that you have real influence on your focus level will give you a boost to continue practicing systematically and effectively. With time, you will strengthen your “concentration muscle” to such an extent that you will be able to use it for focusing as you want it and whenever you want it – it’s a key to the art of focus. You begin a task and suddenly remember about something else that needs to be done, so you switch to another task, dropping the previous one unfinished, and so on and so forth. Does that sound familiar? Skipping between tasks can be very exhausting and is utterly unproductive. If that’s also your problem, group your tasks for the day/week according to the scheme below. 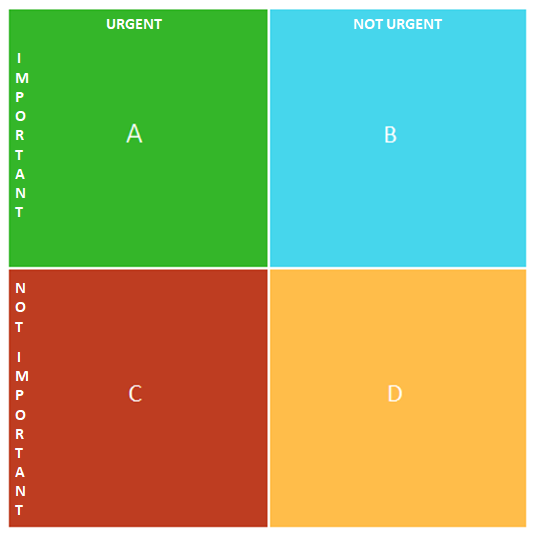 It’s the so-called priority matrix that US president Eisenhower used (Eisenhower box) and he was known for his excellent time management skills, which also boosted the performance of his staff. The priority matrix helps to focus on the tasks and people that are most important to us. You read the Eisenhower matrix as follows: box A contains urgent and important actions, which means that it usually has serious consequences if they are not completed. These often include emergency situations, matters neglected or tasks not completed on time. Box B contains important but not urgent actions, which you can spread out or do systematically (e.g. workouts). Box C – urgent but not important matters, which should follow the box A tasks but come before the box B tasks. Some of them can be delegated, e.g. paying bills or fixing something at home. You fill in box D with things that are neither urgent nor important. These things, paradoxically, become our most notorious distractions and sway us from completing important and urgent tasks. Give yourself a minute to reflect on that. If you feel that it might be useful for you, give the Eisenhower matrix a try. For a few days, use it for setting your daily priorities and checking your progress throughout the day. Draw a four-box square (on paper or electronic device) and fill its boxes with grouped tasks from your to-do list. Make it your daily routine, and soon you’ll see that you will conquer the chaos that used to unseemly draw you into a vicious circle. As a result, it will significantly improve your focusing skills and boost your productivity. It’s hard to concentrate on a single action when Google overloads us with hundreds of theories, often conflicting, on each topic. Apart from common sense and logical thinking, you’ll find the art of detachment quite useful here. Don’t believe everything you read and watch on the internet. Don’t ask Google Assistant how to live your life. Call into question the information you’ve found there. Ask questions, and look for answers within you: what is important to you, what is no good for you, etc. If you have no clue how to develop selective attention skills, read the book by Noreena Hertz “Eyes Wide Open”, which I absolutely recommend. As long as you stay conscious of the need to filter information, you will be able to blow off irrelevant little things without regret and focus on really important things more easily. Daniel Amen, a psychiatrist and specialist in brain imaging, asserts in his books that how we eat has a huge impact on how our brain works. In order to boost your concentration, Daniel Amen recommends eliminating caffeine (and switching to green tea), optimizing the level of B vitamins and vitamin D in your blood and taking fish oil and folic acid. If you like to bite on little snacks while working on a high-attention task, Brazilian and Italian nuts, almonds, cashews and apples are good choices. You can also help your concentration by exercising regularly and getting enough sleep. It’s as simple as that. If you need to be more focused, instead of drinking another coffee, grab an apple or a handful of nuts and take yourself out for a walk. Don’t make excuses that you don’t have time for this. A few minutes is enough for the brain to switch to the concentration mode, besides, after charging your batteries on a walk, you will get down to your tasks with a vengeance. I guarantee that if you try out even only half of the practices I suggested above, you will still significantly improve the quality of your life. Remember that concentration is like a muscle and it has its muscle memory. This means that the more you exercise it, the stronger it becomes. Draw conclusions from what you have just read. And practice everyday. Take the most of every opportunity to work on your focusing skills. Let it become part of your life, your daily ritual.